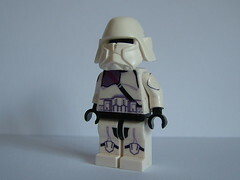 CC-1138, also known as Bacara, was a clone marshal commander who served in the Grand Army of the Republic. 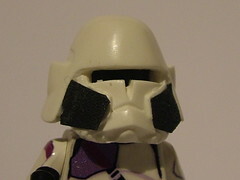 CC-1138 was given command of the 21st Nova Corps, and eventually he was selected to be part of the initial ARC training program under the command of Alpha-17. Decals by the Fine Clonier (Printed and applied by me), and helmet cast by Arealight. Helmet probably requires decals, but I'm inclined to leave it as it is. Probably also still needs a kama. So, as to my first permanent LSW figure: how's it look? Looks very nice, although the helmet seems a bit naked without any detailing on it. Even if you just coloured the cheek plates in, it would add a better overall completeness. 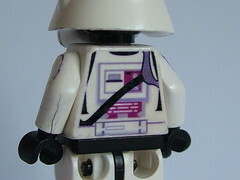 Problem with the arm is that he's already applied the decal to it. Small nit-pick though.........change out the cracked arm. Ironically, that was the best one I had to hand. I'm sorting out these first problems (As well as making the kama) as I go along. Ahh..I printed out about three of these, so no problem with re-applying it. I have enough. Maybe it'll look better, even. I've added some face detailing by (GASP!) cutting up an MMCB cape. Best fabric to hand, though, and it's held on with Sculpy.